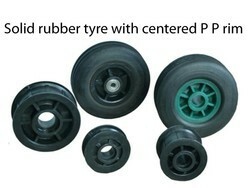 Trolley Tyres are used for driving allow braking superior abrasion resistance, good load capacity. Suitable for general pavement road, mixed road surface, the short distance use, apply to drag wheels and driving wheels. we are manufacturing solid rubber wheel for shopping trolley which is used in mall, Dust bin, grass cutter etc. in Ahmedabad, Gujarat. Century GSE tyres are a variant of resilent tires used for baggage trolleys and container dollies at airports, a tough durable tire with an advanced tire compound to help combat all types of tyre wear and failure. we are the manufacturer of all kind of trolley . we use to MANUFACTURE according to your specification also . Having widespread product and market acquaintance, we have been capable to offer a quality approved Trolley Wheel Tyre to our customers based across the nation.